The annual Commercial Realtors Association's Deal Maker Awards recognize San Diego's top commercial real estate brokers. With the holiday season now in full swing, retailers are anxious to see what this year's season will bring them. In looking back over the past year as president of the Commercial Realtors Association of San Diego (CRASD), a few thoughts come to mind. A cacophonous media assault on residential real estate values in September and October gave occasion for pause to even the steadiest hand and strongest constitution. Despite the apparent irrelevance to the rationally structured world of commercial real estate, I noted a concurrent, pregnant pause in investor decision-making followed by a discernible and distinct paradigm shift in commercial property valuation and evaluation. Many of San Diego's older communities are looking for community leaders to take the reins when it comes to revitalization. These efforts are often put on hold because of construction costs, local economics and building restrictions. However, local grown leaders like George Harbaugh know the risks and put together a team consisting of Principal Mark Swenson of Studio C Architecture, Rosado and Associates for property management, Retail Properties Group for leasing, and Davis & Adams Construction for building. Grubb & Ellis|BRE Commercial is in the business of helping people. As a commercial real estate firm, its brokers help tenants find new space, landlords lease and sell space and clients learn the nuances of the marketplace and intricacies of the business. Fallbrook Mercantile Center, a 74,409-square-foot retail center located on South Main Street in Fallbrook, a San Diego County community, is one of 16 West Coast retail properties that were sold in a $412,095,604 portfolio transaction handled by Burnham Real Estate's Retail Advisory Group. The transaction represents the Burnham group's largest sale yet and is contributing to a record year in which its total sales and lease volume will exceed $590.9 million. The Daily Transcript has selected the county's largest apartment transaction for the 2006 Editor's Award. The sale was featured in the Daily Transcript's Deal of the Week on Aug. 15, 2006. San Diego Mayor Jerry Sanders will be the keynote speaker for the annual Commercial Realtors Association (CRA) Deal Maker Awards breakfast. Commercial Realtors Association San Diego County, a real estate association, offers professional development opportunities to commercial real estate brokers who strive to be the best in their industry. The Daily Transcript and the San Diego County Commercial Association of Realtors present the annual Deal Maker Awards, recognizing top commercial real estate producers and transactions. The Daily Transcript is pleased to partner with the Commercial Realtors Association to present Deal Makers of the Year 2005. 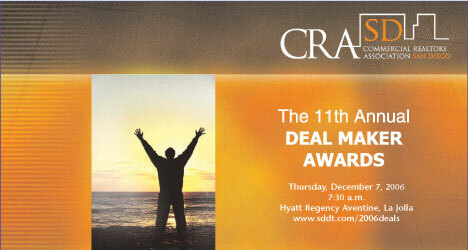 The 10th Annual CRA Deal Maker Awards breakfast recognizes San Diego's top commercial real estate brokers in retail, industrial, land, investment and office space.